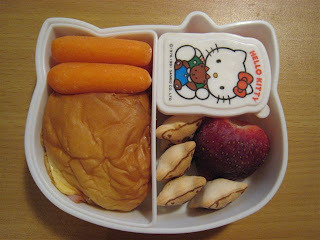 Faith has a sandwich on a mini-roll (ham, cheese & cream cheese), carrot sticks, vanilla yogurt in the HK container, a few koala cookies and a big strawberry. I too, have just discovered your blog, and THANK YOU for sharing your phab-u-lous ideas! Phew!! Tried the skewers as a dinner idea tonight, and was amazed what they'd eat (that they normally wouldn't) if it was stuck on a bamboo skewer. Again- thank you. I do have some questions regarding the types of fruit you freeze, and your process... whenever you have a chance. Thanks again!